Wayne H Mecham passed away at the age of 97 on May 17, 2016, in Mesa, Arizona. He was born on December 9, 1918 in Mountain Home, Utah. As a young man, he fulfilled a mission for The Church of Jesus Christ of Latter-day Saints in the North Central States mission. He served in the U.S. Army and was a World War II Veteran. He married Geneva Seamons on Dec. 29, 1942. They had been married for 54 years at the time of her death in 1997 and there is no doubt that they had a joyous reunion upon Wayne’s passing. He was a successful dairy farmer in Hunt, Idaho. In 1956, the family moved to Glendale, AZ, where Wayne became an auto dealer with his brother. This was his profession until retiring in 1984. Wayne had a sense of civic duty. He was active in the political process and involved in his community. Wayne was especially known for his service in The Church of Jesus Christ of Latter-day Saints. He held many positions, including bishop and stake president. Among his many fine characteristics, he was noted for his integrity, service, generosity, patriotism, devotion to family, work ethic and leadership qualities. He was a strong force for righteousness. 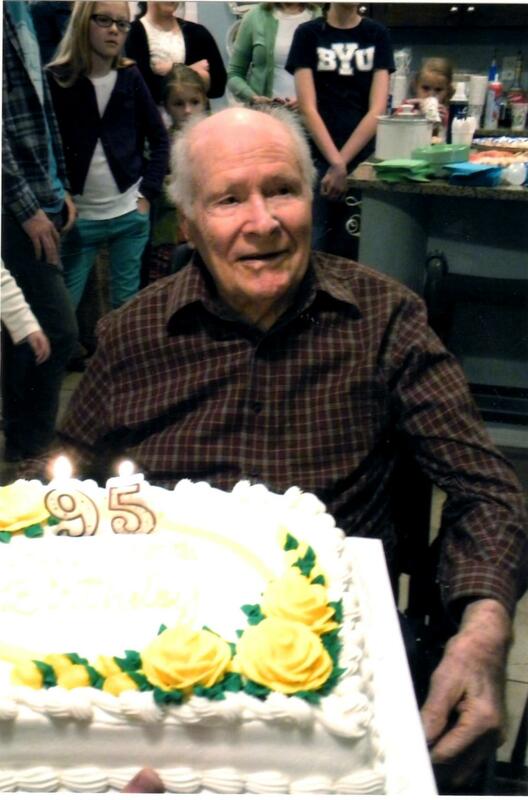 He is survived by his 9 children, 61 grandchildren, 171 great-grandchildren, and 3 great-great grandchildren. He is loved and revered by his posterity. His presence will be sorely missed. Services will be Saturday, May 21st at the LDS chapel located at 5250 W. Thunderbird Road, Glendale, AZ. Public viewing will be at 9:30 AM and the funeral will begin at 10:30 AM. Interment will be at Greenwood Memory Lawn Cemetery, 2300 W Van Buren St, Phoenix, AZ. My thoughts & prayers are with the Mecham family today! My mom & dad really loved your parents! They really enjoyed being their home teachers for years. Having gone through the same trial with their spouses, my dad really thought highly of Wayne. At times I’m sure it helped him care for our own mother! They spoke of them often! What a legacy. Thank goodness for the knowledge we have of the hereafter. Blessings to all the family. Our thoughts and prayers are with you and your family! We know you loved you father so much. Rod and I were blessed to have Brother Mecham as our Bishop and our Stake President. He was a great man and leader. We loved him. I want to offer my sincere condolences to the family. I am so very sorry for your loss. Our Heavenly father, Jehovah God, in His word the Bible, calls death an enemy (1Cor. 15:26). He promises in the very near future to do away with death(Rev. 21:4, 5). At that time tragedies and accidents will be a thing of the past, and no one will ever get sick (Isaiah 33:24), and there will be a reuniting, a bringing back to life instead of losing life (John 5:28,29). I hope these words can give you some comfort and hope (2 Cor. 1:3, 4). Once again I am so sorry for your loss.